On October 26th, the 7th Conference on the Study of Intangible Folk Cultural Properties was held with “Passing down Recollections and Records: Disasters and Intangible Folk Culture” as its theme. 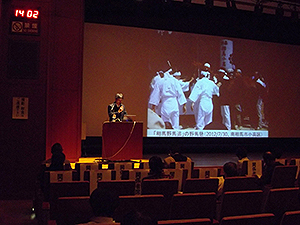 Following up on the 6th Conference on “Intangible Cultural Heritage in Post-earthquake Reconstruction” that was held in December of last year, this year’s Conference delved further into the topic of disasters and intangible folk cultural properties. Ways of passing down intangible folk cultural properties to future generations are normally an extremely important topic, but this topic is particularly pressing in regions that were disrupted and depopulated by the tsunami and nuclear plant accident resulting from the March 11, 2011 earthquake. Thus, the 7th Conference covered “Records,” which is one way of passing down intangible folk cultural properties. Invited to the Conference were 5 presenters who dealt with records in various capacities following the disaster and 2 commentators. These experts described and discussed previous efforts and issues and prospects for the future. Various recording techniques and uses of records were presented during the Conference. In addition, the importance of a network linking efforts was again confirmed from various perspectives. The 7th Conference was also attended by many relevant personnel from regions potentially slated to suffer a large-scale disaster in the future. Steps that can be taken and steps that should be taken to prepare intangible folk cultural properties for crises in the near future, such as massive disasters, the falling birthrate, aging of the population, and depopulation of rural areas, are important topics warranting future discussion. Plans are to publish a report on the Conference’s proceedings in March 2013.